Thanks to the emergence of vibrant media platforms such as YouTube, Instagram, Pinterest and Twitter – laying the tourist bait has never been easier. Social media has not only created instant celebrities – it’s created instant mega travel hotspots. We’re living in a culture of “gimme now” and sadly, tourism boards are struggling to realize that their beautiful bait will only work for so long, if the damage done by unfettered tourism switches up the things people desire. The mass market wants in on everything “buzzing” and right now, it’s ruining the worlds most beautiful places. DiCaprio fan? Tarnished and over crowded is hardly the way to celebrate the very beach that inspired the cult classic movie “The Beach”. In recent years, you could hardly walk, let alone lay down at this once perfect spot. To work out a future solution and let the beach recover, Thailand will close the beach for months in 2018. 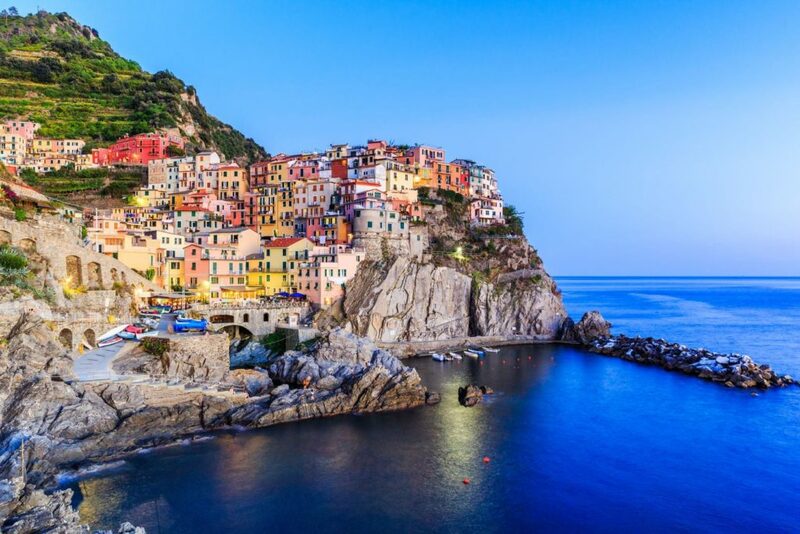 If you’re coming to the Cinque Terre, make it an off peak visit. Instagram fame has brought the masses from all over the world to this quaint area along the rugged hillsides, in the north of Italy. For what it’s worth, the views are just as promised in pictures and are still stunning, even if you have to elbow someone to take a snap. Tourism officials are debating capping visitors each year, and have recently actually encouraged travelers to go elsewhere! Of all places, Jeju Island – Seoul is the busiest flight route in the world. A whopping 15 million tourists, largely dominated by mainland Chinese visitors flock to the (once) pristine Korean island every year via 180 daily flights. Many Chinese tourists use the island as a day trip, which means there’s minimal financial benefit for locals. Unfortunately, South Korea is considering a second airport to add even more visitors. It doesn’t look like this one will improve anytime soon. Fascinated by the Northern Lights? Well, unless you’re splashing out, you’ll be bussed to an attempted viewing with thousands of others. In case you didn’t know, light is the enemy of the Aurora Borealis and therefore, the experience is becoming increasingly tainted. Instagram has made Iceland one of the most visited destinations, and things are starting to spiral out of control. But to be perfectly honest, it’s still worth going. Ornate architecture, iconic food and wine, water taxis and colorful “streets” make this one of the most sought after destinations on earth. But mass market tourism via cruise ships and group bus tours has made sights such as St. Marks Square impossible to enjoy. Tourism heads are imposing fines to curb trashy tourist behavior, such as littering and are also limiting new hotels in attempt to thwart the rising problem. With 82 million visitors in 2017 alone, Spain is experiencing a prolific tourist boom. But Barcelona is feeling the strain. Visitors hoping to enjoy some laid back tapas or catch the iconic Sagrada Familia, Park Guell, La Rambla and surrounding area now find increasingly brutal crowds, rising prices and a disdain for all things “tourist”. It’s become such a problem, residents have taken to the street, in protest of tourism itself. If you’re headed to Barcelona, avoid public holidays. A trip to Caño Cristales is the most naturally pleasing way to hallucinate. Unique microorganisms living in the water make colors from pink to red, green and blue dance in the light, right before your eyes. And the waterfalls – yeah, they’re gorgeous. The recent Colombia tourism boom has put the delicate ecosystem into a state of flux, jeopardizing the one thing which makes this spot truly unique. Once an exclusive sought after destination, Boracay was recently declared a cesspool. Nope, not by snarky travel writers – but by the Philippines own president. Rampant mass market tourism and lack of infrastructure have resulted in dire consequences, with recent reports of sewage flowing into the ocean. The island will temporarily close to visitors while authorities plot a sustainable resurgence for this once magnificent island. The Great Wall of China is on virtually every bucket list, and that’s entirely the problem at the moment. Everyone wants to see it, everyone wants the perfect photo and large scale tour groups are all descending upon very specific stretches. If you want an iconic Great Wall moment, hire a private guide. Any good guide will take you at a perfect time to a place with hardly anyone around. Problem solved. Have you experienced over tourism recently? Paradise Found, Paradise Lost. Thank globalisation, affordable air travel, mass communication, and 7.5 billion people on the planet. What can go wrong. How true. If you want to experience the worst of tourism, try going into the Louvre anytime that isn’t off peak. Even in the odd times, crowds with those damned selfie sticks can ruin it. When I was trying to get close to see the Mona Lisa, a 4′ Asian woman was elbowing everyone to get a damned selfie with the f’ing flash on, which made me crazy, because not only did I get a kidney shot, using a flash on a painting helps deteriorate the painting itself. The lack of common courtesy and simple respect for the museum itself was appalling.